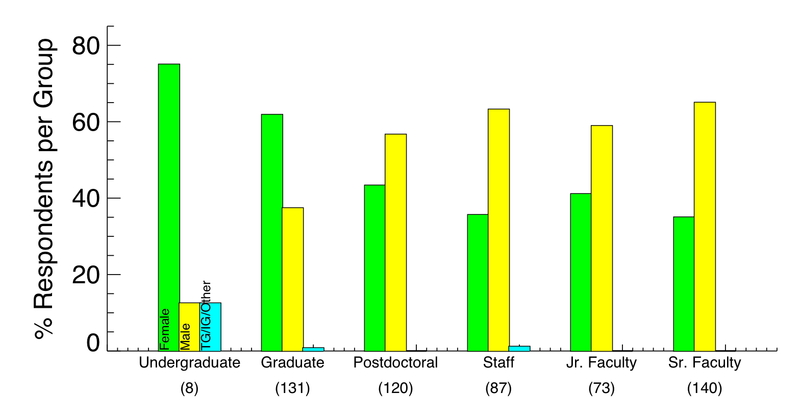 The figure above shows this breakdown, separated by educational level of the student (high school, undergraduate, graduate and postdoctoral researcher), their gender, and the gender of their advisor. 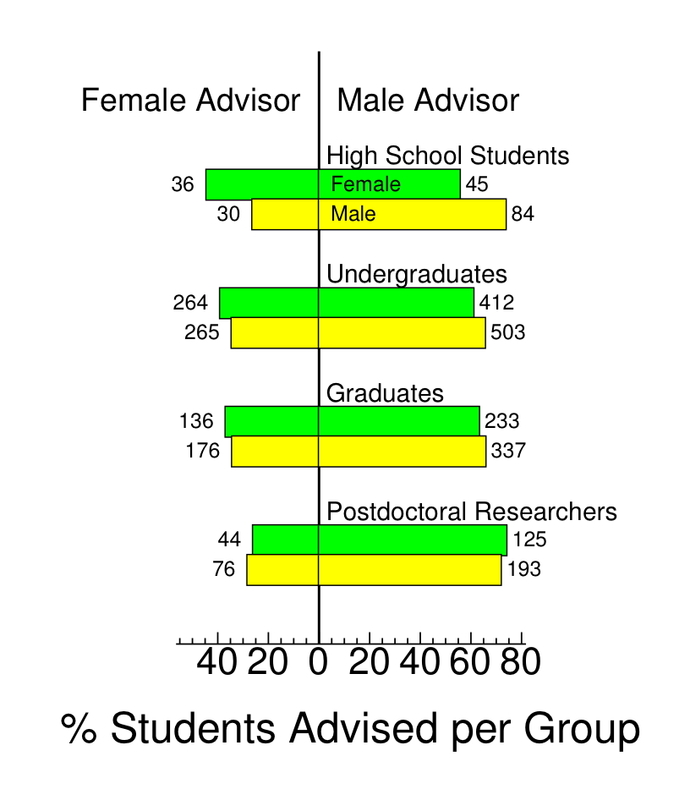 These results confirm our underlying suspicion: female students are not advised by female advisors nearly as often as male students are advised by male advisors. As one progresses through the academic stages, this disparity gets worse, from 44.4% at high school to 26.0% at the postdoctoral level. In contrast, 65-74% of male students are advised by male advisors at these educational levels. So female students are less likely to have a same-gender advisor than a male student, and as such are more likely to face cross-gender issues. An example of a cross-gender issue we found in our survey was that many common “grey area” situations are viewed to be more inappropriate in cross-gender student/advisor relationships than in same-gender relationships. With fewer female advisors, female students are more likely to experience, and possibly be negatively judged on, these situations than their male counterparts. Why does this happen? Because there are simply fewer female astronomy advisors in academia than males; or more precisely, fewer women in faculty or staff positions that can advise any students. We see this clearly in our sample – while overall we had just over 50% male respondents, the percentages change when we break the numbers down by professional status, as shown in the figure below. Among students, 54.1% were female and 45.9% were male; among academic faculty, 37.1% were female and 62.9% were male. These statistics are well-known, and a reflection of what many consider to be a “leaky pipeline” in astronomy. Percentage of survey respondents broken down by gender (female in green, male in yellow, transgender/intergender/other in blue) and professional position. Total numbers of respondents in each professional category are listed along the bottom. Undergraduate and graduate students who responded to the survey were mostly female, while postdocs, staff and academic faculty members were mostly male. Indeed, our respondent numbers are actually better than contemporaneous accounts of the representation of women in astronomy, which indicate roughly 20-25% of professional astronomers are women, as opposed to 37.1% here. We also noticed that the fraction of females students responding to our survey was higher than the fraction of female students reported by their advisors in the first figure above: 43.8% female versus 56.2% male overall, dropping to 38.6% and 61.4% at the postdoctoral level. This discrepancy indicates that our respondent sample is probably biased toward more equal parity than what actually exists in astronomy (perhaps not surprising given that this work was presented at a Women in Astronomy conference), and that the actual fraction of female students advised by female advisors may be even lower. Good work! I’m curious to see if your hypothesis, that cross-gender advising relationships lead to an increased perception of inappropriate behavior, holds up in other fields of science, including those that are dominated by women.